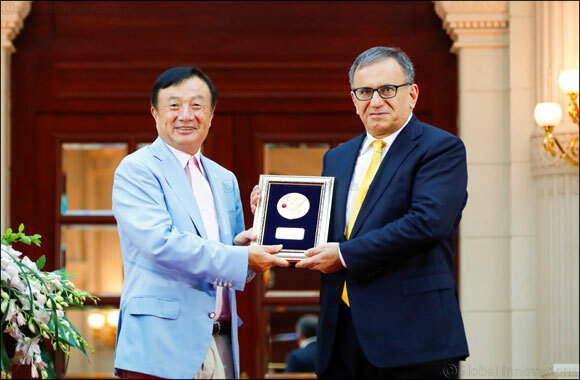 Dubai, UAE, August 16, 2018: Huawei presented a special award to Turkish professor Dr. Erdal Arikan, the inventor of polar codes for 5G, in recognition of his outstanding contribution to the development of communications technology. At the ceremony, held at Huawei's global headquarters in Shenzhen, the company also honored more than 100 Huawei scientists and engineers who are working on standards and basic research. Basic research is key to industry development. Theoretical breakthroughs, often made after decades of focused scientific effort, help set the direction of technological progress. With 5G just on the horizon, the paper on polar codes that Professor Arikan published in 2008 defined an entirely new approach to maximizing the rate and reliability of data transmission. Polar codes are the world's first channel coding scheme to bring us up against the threshold of Shannon's limit, or the maximum rate that data can be sent with zero error at a particular bandwidth. Polar codes significantly improve coding performance for 5G. At the same time, they reduce the complexity of design and ensure service quality. In 2016, 3GPP (the international standards body responsible for 5G standards) adopted polar codes as the official coding scheme for the control channels of 5G New Radio (NR) eMBB interface. In 2010, Huawei recognized the potential in polar codes to optimize channel coding technology, so the company invested in further research to build on Professor Arikan's work. Through years of focused effort, the company has made multiple breakthroughs in core polar code technology, helping polar codes move beyond the realm of academic research and see the light of day. At the awards ceremony, Huawei also honored more than 100 of its in-house scientists for their work on basic research and standards. In particular, the company wanted to recognize their successful research in 5G New Radio and their eight groundbreaking innovations, including new waveforms and new coding schemes. These scientists worked closely with industry partners to verify key technologies and drive the standardization process, making an important contribution to 3GPP's 5G Release 15 standards.